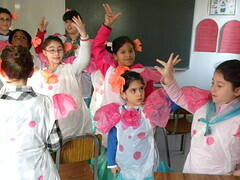 This year we celebrated the third annual Home of the Mother Holy Week Encounter in Lumezzane, Italy. 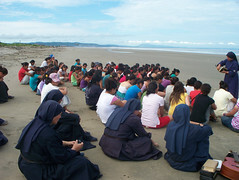 For some of the adults and young people who attended the encounter, it was the first time that they celebrated Holy Week with the Home of the Mother. 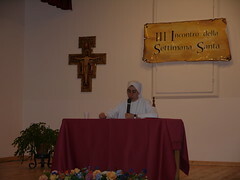 We opened the Encounter on the evening of Holy Thursday with a commencement talk given by Sister Teresa. The theme this year was the Second Vatican Council Pastoral Constitution ¨Gaudium et Spes,¨ which talks about the Church in the modern world. This year’s Holy Week Encounter in Ecuador began with the Chrism Mass on Holy Thursday in the Portoviejo Cathedral, celebrated by Archbishop Lorenzo Voltolini. Over 100 priests from the diocese all concelebrated, including Fr. Juan, Servant Priest of the Home of the Mother. 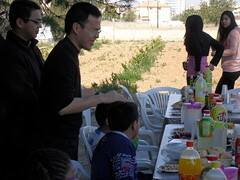 The Archbishop spoke about the new evangelization; he encouraged us not to be afraid and to share Christ with the world. His homily was providential because it fit in perfectly with this year’s theme for the Holy Week Encounter: evangelization. 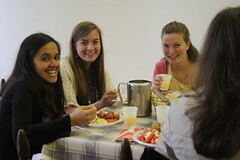 Nine university students spent Holy Saturday at the Servant Sisters´ house in Rome for a one-day retreat in order to reflect and spend time in prayer. In the heat of the Ecuadorian sun, after quite a few rainy days, Father Juan and Brother Kristian, Servant Brothers of the Home of the Mother, arrived in Ecuador in order to do some apostolic work. 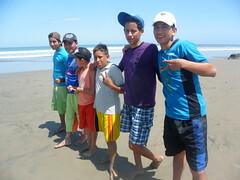 First mission: lead a boys' camp. The 4th Home of the Mother Summer Encounter began here in Ecuador under St. Joseph´s protection on March 19th, and was brought to a close under Our Lady´s mantle on March 25th, the Feast of the Annunciation. 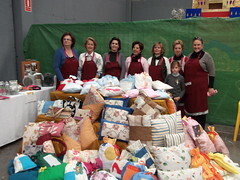 The get-togethers organized by the Servant Sisters of the Home of the Mother in Alcalá de Guardaría, in the south of Spain, continue to be a huge success. We do not know what the secret is that makes so many girls want to keep coming back to visit us in this special place, blessed by their Patroness, Our Lady of the Eagle, but we can always count on at least 50 girls showing up. Surprising, but true. This time, on March 17th, the birthday girl came. She decided that there was no better way to celebrate her birthday than in the company of so many good people. We celebrated her 23rd birthday with a Spanish San Marcos cake, and thanks to all the details that the girls had thought of, at one point she exclaimed, “this is my best birthday ever!” This was all brought about thanks to the simplicity and joy that Our Lady always conveys with her pure gaze. 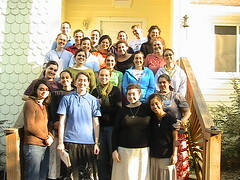 The Servant Sisters of the Home of the Mother continue to work on the project begun by Fr. Francisco Sojos, the parish priest of Our Lady of Loreto, where the Servant Sisters work in Guayaquil, Ecuador. Their idea is to build a house for the Sisters in Cóndor, a part of the parish, along with a Home of the Mother residence for university students, and to build on to the chapel that already exists. The Servant Brothers of the Home of the Mother are proud to have had their first Eucharistic Mission, lead by Fr. 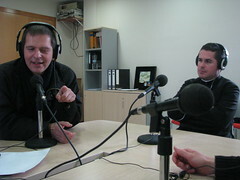 Félix López and Fr. 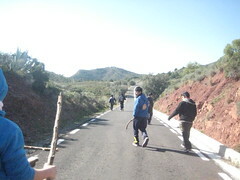 Henry Kowalczyk in the town of Macael in southern Spain. 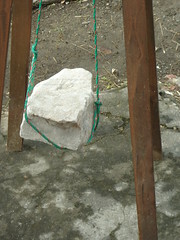 Already having contact with the local parish priest, we were able to start working immediately after arriving. 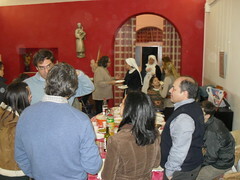 This past Saturday we had a get-together for younger and older girls at Our Lady of the Eagle Shrine in Seville, Spain. About 40 came all together. 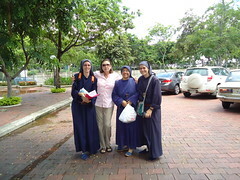 Our Mother Mary, as usual, gave us a beautiful day, with the sun shining, making it easier for us to hold the actividades we had planned for the girls. On a Marian Pilgrimage in Madrid! 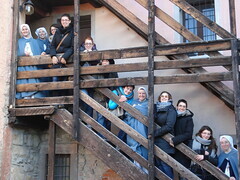 The Servant Sisters in Brignano, Italy went on a pilgrimage with a small group of girls to visit Sotto il Monte on Saturday, January 7th. The name of the town might not mean anything to most of us, but it is significant for being the birthplace of Pope John XXIII.